Students Against Israeli Apartheid at Carleton University in Ottawa, Canada led a protest at Carleton University on November 7, 2011 against the University’s official sponsorship of a fundraising dinner for the Jewish National Fund, including Carleton’s president, Roseann Runte, serving as honourary co-chair of the dinner. The students pointed to the JNF’s major role in the Palestinian Nakba in 1948, and its ongoing involvement in ethnic cleansing in Palestine. The JNF, owner of 13% of the land in the State of Israel, officially refuses to rent, lease, or sell its land to non-Jews – most centrally, in this case, Palestinians, including Palestinian citizens of Israel. The JNF has been involved in ongoing ‘settlement’ activities to displace Palestinian villages and towns inside Israel, as well as its notorious tree-planting campaigns, which installed thousands of non-native, European and North American trees such as pine trees over large swaths of land, covering and hiding Palestinian villages destroyed by Israeli military forces in the Nakba. The students particularly targeted Canada Park, a JNF-implanted forest installed over the ruins of two Palestinian villages destroyed by the Israeli army in the 1967 war, to which JNF Canada committed millions of tax-exempt dollars. Runte, who has in the past stated that she cannot “take sides” on political issues, continued to maintain that her participation as an official co-chair and endorser of the JNF dinner was somehow an apolitical event. At the same time that the University’s administration is listed as a sponsor of the Jewish National Fund, and its ethnic cleansing projects in Palestine, it simultaneously has prevented students from bringing their divestment campaign to the Carleton University governing board and threatened students with punishment if they disrupt the meeting to make their silenced voices heard. 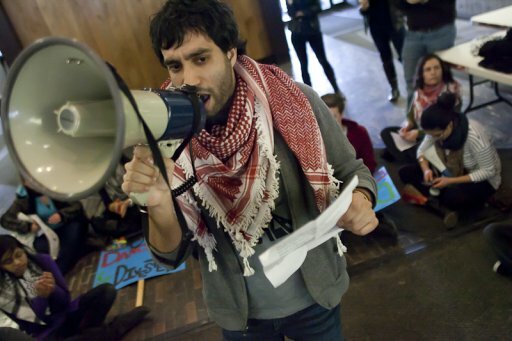 Carleton has also, in the past, prohibited the distribution of a poster advertising Israeli apartheid week, deeming it offensive. The poster, linked here, includes a widely distributed cartoon depicting Israel’s war on Gaza, for which the University’s administration saw fit to accuse students of violating human rights codes. Runte refused to remove her name, or the university’s official sponsorship, from the JNF dinner, but the students’ protest has made it clear that Carleton’s students do not stand – or dine – with apartheid.